This is the car that will replace the Territory and stand as Ford Australia’s full-size SUV offering once local production stops. 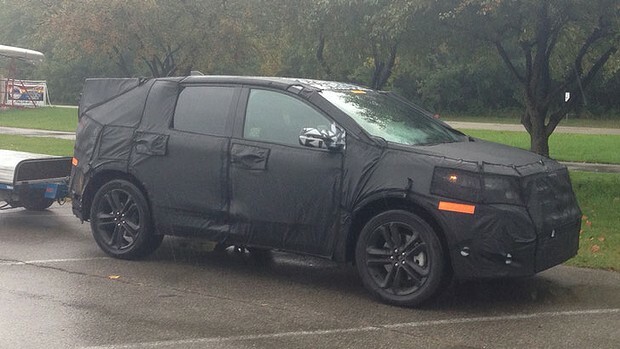 Ford is reportedly set to reveal the SUV that will replace the Territory at the Los Angeles motor show later this month but Drive spied this development prototype in America recently. Reports from the US indicate that Ford is planning to display a thinly-veiled concept version of the 2015 Ford Edge SUV at the California show that begins on November 22. The Edge is expected to be Ford’s next global SUV, sitting above the EcoSport and Kuga in the range, while a more rugged seven-seater called the Everest will be based on the Ranger ute to suit more adventurous families. Well-placed sources have told Drive that the Edge will replace the Territory once local production stops, although Ford Australia hasn’t officially confirmed that yet. Ford Australia has also been non-committal on the future of the Territory name, despite stating the Falcon nameplate will die with the locally-made car, leaving the option open to re-badging the Edge as the Territory when it hits Australian showrooms. Exactly when the Edge arrives is unclear. Ford Australia has said it will close its local factories in October 2016, but that is likely to be dependent on sales of the refreshed Falcon and Territory remaining high enough until that time to justify maintaining production. The US reports indicate the new Edge will go on sale by the middle of 2014 which could mean it would be available to Ford Australia later that year or early in 2015. It will be great to see the Edge hit the Australian market. I did about 1500 miles in one of these in the US earlier this year. Great car to drive, handles well for an SUV and sharp performance - not to mention reasonable fuel consumption for a big'ish SUV. I also had a Lincoln MKX for a week, which is the "Luxury" version of the Edge... very well appointed, I hope we see this sort of offering for the higher end of the market. I wonder if they will have them in manual, and what the cost will be? As a 7 seater I can see them having no boot space, unless they square up the back end. Import the excursion or e-series van! I've driven both when I was overseas last year and the saying bigger is better couldn't be more true. Plus the van comes with a 6.8L v10! Here's a better, although fuzzy, image without the camo. looks like a super sized jacked up Ford Focus, not that that's a bad thing! WTF, we are getting smaller and smaller s**t, I liked Falcon wagons due to cargo space, they dropped it and we ended up with less in a Territory, lucky for Ford, Holden dropped the full size wagon for a poser wagon so companies purchased Territory's, now they are replacing them with smaller US crap, lets face it, once it is over here and if it is built in the US, it will fall apart, look at the old Exploder's for a good example. The Asian car manufacturers are going to love this, even they make bigger cargo area cars now. Vehicle transport side of defence contractors use to tell me the FG had a bigger usable cargo space than the Commy wagon with a cargo barrier, they had problems fitting the soldiers stuff in the back when transporting them around. Waggin, you know our roads, do you think the Edge will be such a nice drive around NekNock roads?